It’s October, and as always, we are going to see new phones launching almost every day. We have already seen the launch of Google Pixel 3/Pixel 3 XL and the Razer Phone 2, and on October 16, Huawei will launch its Mate 20 series. 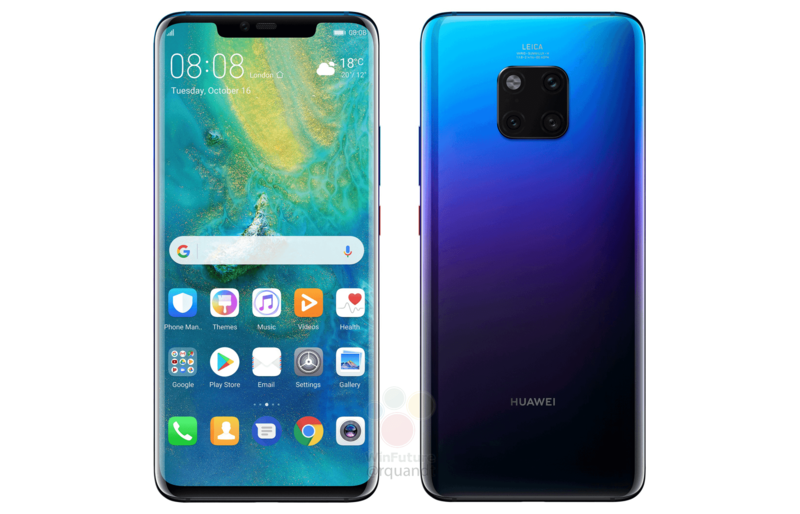 The Huawei Mate 20 Pro is going to be the best flagship made by Huawei this year, and it will be a feature-packed phone including a powerful processor, a big battery, superb cameras, a great display, and a nice overall design. Today, almost everything about the Mate 20 Pro was leaked by WinFuture so in this article, let’s talk about that in detail. With a starting price of 1,000 Euro, this is definitely not going to be a cheap flagship like the OnePlus 6 or the upcoming OnePlus 6T. Still, this is not new since we already have 1000$ flagships from Apple and Samsung which are the top 2 smartphone companies in the world (Huawei is the third!). Design wise, the Huawei Mate 20 Pro has a notched display on the front. And unlike the Mate 20 that has a waterdrop notch, the Mate 20 Pro has a big iPhone X-like notch. This is due to the fact that the phone has some extra sensors on the front. There is a squared triple camera setup on the rear with LEICA branding. As you can see, the fingerprint scanner isn’t placed on the rear which means the Mate 20 Pro has an in-screen fingerprint reader. The USB Type-C port is placed on the bottom, and there’s no headphone jack. Coming to the specifications, the Huawei Mate 20 Pro has a 6.39-inch Quad-HD+ OLED display with a resolution of 3120 x 1440 pixels. As mentioned above, the phone has a big notch since there is a Vertical Surface Emitting Laser (VSEL) module in it for a more accurate Facial recognition, even in the dark. We all know by now that the Mate 20 and Mate 20 Pro are powered by the Kirin 980 processor from Huawei and in case you don’t know, it is a 7nm processor with two Cortex A76 cores clocked at 2.6GHz, two Cortex A76 cores clocked at 1.9GHz and four Cortex A53 cores clocked at 1.8GHz. This is also the first processor to feature the ARM’s Cortex A76 cores. There are Dual NPUs and ARM Mali-G72 GPU. The Mate 20 Pro has 6/8GB LPDDR4X RAM and 128/256/512GB UFS 2.1 internal storage. The Mate 20 Pro doesn’t come with a microSD card slot but looks like Huawei is going to announce a new way to use microSD card in the Mate 20 Pro. The company calls it ‘Nano-Memory cards’. So, the size is going to be similar to the nano-SIM cards and so, users will be able to insert them in the phone via the SIM card slots. But the catch is, the users will have to buy those from the company itself since the ones from third-party manufacturers might be slow and therefore, cheap, affecting the overall performance of the phone. Coming to one of the main highlights of the phone, the cameras. The Huawei Mate 20 Pro has triple cameras on the rear that include a primary 40MP sensor with f/1.8 aperture and a Light Fusion Technology for better photos, a 20MP telephoto camera with f/2.4 aperture and an 8MP Ultra Wide Angle lens. With the Mate 20 Pro’s cameras, you will be able to shoot ultra-macro shots from a distance of only 2.5cm. Features like the Night Mode, Scene Detection, 5X ZOOM etc. are there, and we have already seen these in action in the P20 Pro. On the front, there is a 24MP camera for selfies. The Huawei Mate 20 Pro has a huge 4,200mAh battery that supports an impressive 40W Fast Charging. This means that the battery will go from 0 to 70% in just 30 minutes. And the Mate 20 Pro also supports Fast Wireless Charging. Devices like Huawei’s Freebuds 2 can be charged with the phone itself since they too support Wireless Charging. Huawei calls it the ‘Reverse Wireless Charging’. So, other phones that support Wireless Charging can be charged with the Mate 20 Pro. The phone is also IP68 rated for Dust and Water Resistance. Android 9.0 Pie runs out of the box with EMUI 9.0 on top. Like the newly announced Pixel 3 and Pixel 3 XL, the EMUI 9.0 on the Mate 20 and Mate 20 Pro has gesture navigation system. Other features of the phone include NFC, Bluetooth 5.0, Gigabit WLAN with Dual band support etc. The Huawei Mate 20 Pro is coming in four colors – Twilight, Black, Green, and Blue. As mentioned above, the starting price is going to be around 1000 Euro, at least in Europe. The launch is happening on October 16.